2019 Krugerrands Spring “Bok” into Silver with These Gorgeous Proofs! The name "Krugerrand" has been synonymous with wealth, prosperity and riches for more than 50 years. First issued in 1967, the South African Gold Krugerrand holds the title of being both the world’s first modern gold bullion coin AND the most widely traded gold coin on the planet, inspiring similar gold bullion series around the globe. However, while other countries had produced silver versions of their bullion coins, collectors had only dreamed of owning official Krugerrand coins in pure silver . . . that is, until the release of the first-ever Silver Krugerrand in 2017! Now in its third year of striking these spectacular silver bullion coins, the artisans at the South African Mint are taking the Silver Krugerrand a step further and giving it the luxury treatment! Using specially treated and polished dies along with hand-selected 99.9% pure silver planchets, this 2019 One-Ounce Silver Krugerrand PROOF is the product of multiple strikes and innovative laser-etching technology. The result is a pristine coin that shines with mirror-like surfaces and distinct, razor-sharp details! In fact, your coin has been graded by the Numismatic Guaranty Corporation (NGC) being in gorgeous Proof-70 Ultra Cameo (P70FUC) condition, a distinction that means your perfectly-graded proof will have ZERO imperfections – showing all features and fields exactly as the engraver and mint intended. In addition, NGC has graded your Silver Krugerrand to be a First Releases (FR) coin, a designation that means your coin was received by NGC or an NGC-approved depository within the first 30 days of its release. It will also be sonically sealed in an acrylic coin holder with a black display core and encapsulated with an exclusive Springbok label. 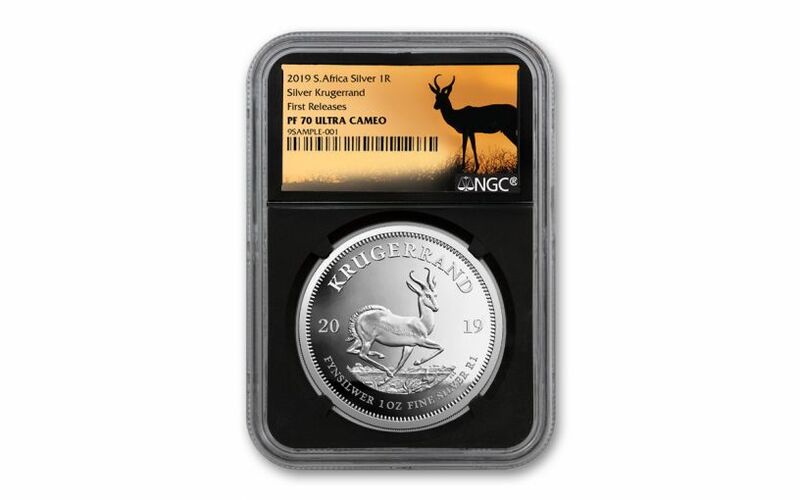 This 2019 Silver Krugerrand Proof bears the same design as the original gold coin – former South African President Paul Kruger on one side and the iconic Springbok antelope on the other. The 2019 One-Ounce Silver Krugerrand Proof has an extremely limited mintage of only 20,000 – a fraction of the production number for the Premium Uncirculated 2019 Silver Krugerrand. In fact, the South African Mint has announced that these Silver Krugerrand Proofs are already sold out! Whether you've already brought a Silver Krugerrand home to your collection or you've been waiting to make one your own, now is the perfect time to join the party! But don't wait much longer – based on past history these coins will not last long. Already Silver Krugerrand proofs from the past two years are selling for substantially higher prices on secondary markets. Who knows what will happen to this year’s edition? Don’t wait to find out – get your 2019 One-Ounce Silver Krugerrand Proof today! 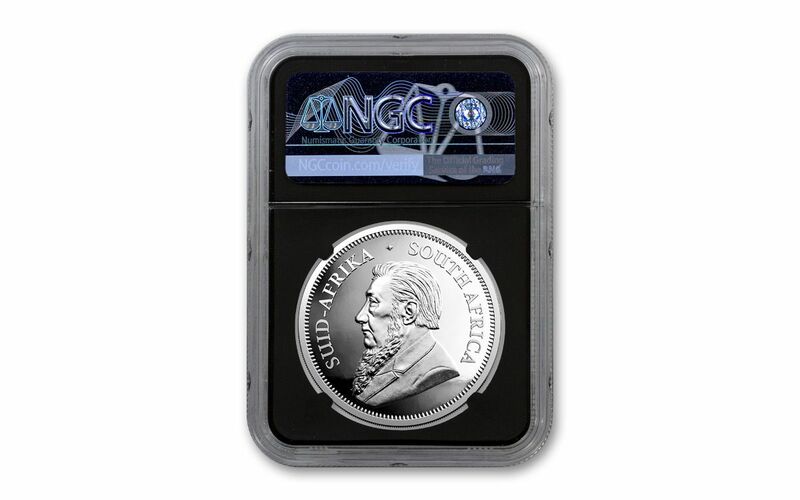 FAMOUS KRUGERRAND DESIGN STRUCK IN SILVER – South Africa’s famous Gold Krugerrand is now available as a silver bullion coin and features the same iconic designs with South African President Paul Kruger on one side and the iconic Springbok antelope on the other. STRUCK IN ONE OUNCE OF PURE SUILVER – These large 38.7 mm Krugerrands are struck in an ounce of 99.9% silver. GRADED IN PERFECT PROOF CONDITION – Your 2019 South Africa One-Ounce Silver Krugerrand has been graded by the Numismatic Guaranty Corporation (NGC) as being in flawless Proof-70 Ultra Cameo (P70FUC) condition. KEY FIRST RELEASES CERTIFICATION – NGC has graded your Silver Krugerrand to be a First Releases (FR) coin. It will also be sonically sealed in an acrylic coin holder with a black display core and encapsulated with an exclusive Springbok label. LOW LIMITED EDITION – The South African Mint struck just 20,000 One-Ounce Silver Krugerrand Proofs in 2019, a number far too low for all the people in the world who would like to add one to their collection. In fact, it’s already announced as a total sell-out at the Mint! Don't wait to claim this global phenomenon for your collection. Bring the 2019 South Africa One-Ounce Silver Krugerrand Proof home to your collection now!